Miller Johnson has published its 2018 Diversity + Inclusion Report, spotlighting the firm’s efforts over the past year regarding its approach and initiatives to diversity in the workplace, legal services and community. 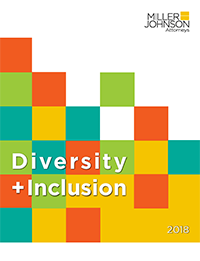 The 2018 Diversity + Inclusion Report can be found at https://millerjohnson.com/wp-content/uploads/2018/09/MillerJohnson-2018-DiversityandInclusionReport.pdf. Miller Johnson is a full-service firm providing legal counsel to businesses and individuals in areas such as business and corporate, employment and labor, litigation, employee benefits, family law, and estate planning. For more firm information, visit our LinkedIn page.